Wipe hard drive file recovery, recover files after wipe hard drive in Windows 7/10/XP computer,recover (pictures, videos,word, pdf, excel) after wipe hard drive. EXFAT / FAT32 / NTFS file system. Wipe hard drive file recovery, recover files after wipe hard drive in Windows 7/10/XP computer,recover (pictures, videos,word, pdf, excel) after wipe hard drive. Use "Undelete" mode to recover deleted files after wipe. Use "Unformat" mode to recover files after wipe hard drive. Use "Recover partition" mode to recover files if partitions changed or damaged or deleted. Use "Full Scan" mode to recover files which can not be found with "undelete" and "unformat" and "recover partition",recover files from raw partition,recover the Word files of partitons which are not NTFS,nor exfat,nor fat32. One Disk Wipe completely and permanently overwrites and destroys all existing data on a hard disk. Once Disk Wipe has been run, all data from every sector will have been eliminated. a job that can be done in minutes. In addition, many drive overlays or special partitioning software is oftentimes difficult to remove by a simple F-disk and Format. Disk Wipe makes this task easy. Two simple steps will completely remov partitioning information. 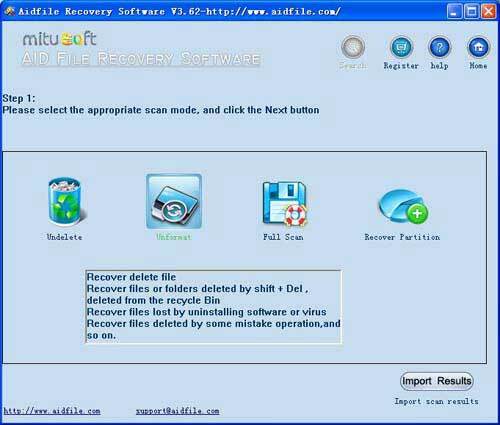 Aidfile recovery software is a professional data recovery software to recover after wipe hard drive partition.